It could have been a replay of the last race. Which in itself was a lot like the sort of race we've seen plenty of times before. Sebastian Vettel won the Italian Grand Prix at Monza with the sort of single-minded ruthlessness that seems ever-so familiar by now. Almost all of the 53 laps were one-sided, Seb having a firm grasp of proceedings. And the result means that he seems to have an equally firm grasp of world title number four. The observer, aside from fervent Seb supporters, today was left to frantically grasp around for remote and circumstantial hope to disrupt the race of one out front. Seb locked his wheel into turn one (and actually apologised for it after the race - he has high standards clearly), which made his first stint a bit harder than usual. It might have rained. He apparently had some kind of transmission problem towards the end, which required him to short shift. But as is his way right now, such things were batted away dismissively; Seb won as he liked. As he always was going to do. And it's now nearly impossible to envisage the circumstances in which Vettel can be deprived of his latest world championship for the collection, short of something utterly incongruous like a driver or team meltdown or else a desperate run of bad luck. With now more than two race wins on Fernando Alonso in the table (and Ferrari not pulling up any trees right now), and the rest even further back, we now moreover enter the part of the year that Vettel and Red Bull really get into imperious mode. 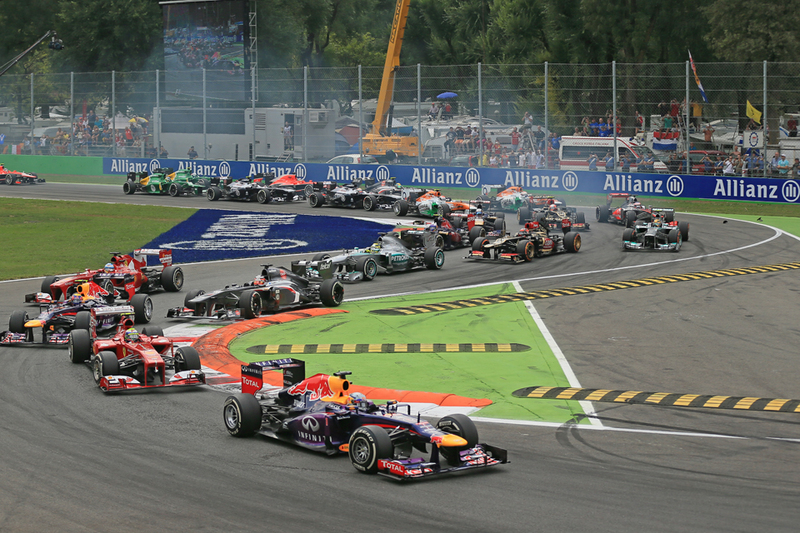 To add to the gall of his rivals, Spa and Monza are tracks that in theory were meant to trip Red Bull up. And what's more those same rivals you feel will today have been sent a long way towards deciding to call off the 2013 fight altogether and concentrate on 2014 with its many regulation changes instead. We could well be at the point where Seb and Red Bull can now freewheel to their respective 2014 crowns. 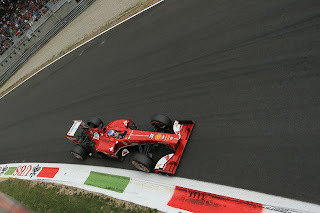 Also just like two weeks ago, Alonso came out on top in the non-Seb class. Just like two weeks ago he barreled through the field to second place in what seemed like no time. Just like two weeks ago when he got there he found he didn't have the legs of the Seb/Red Bull combination out front. All he could do was pedal hard, minimise the points damage and otherwise hope (and he tried a long first stint, which seemed only inspired by a 'what the heck' rolling of the dice, but it didn't do much for him). Even he now gives the outward impression that he's reaching the conclusion that this is Vettel's year. The rest were a bit closer to Alonso this time though. The Ferrari didn't look as happy on the harder tyre and Mark Webber was able to close in on Alonso after their solitary stops. He wasn't able to get near enough to pass, and wasn't helped by a similar transmission problem to Vettel that required short-shifting. 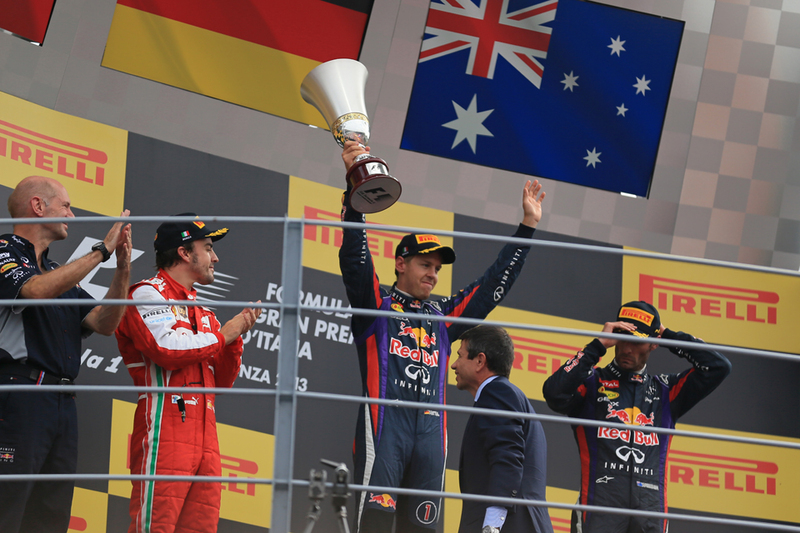 They finished in the same order, and Webber was grateful to get his first visit to the lauded Monza podium, and at the last opportunity. 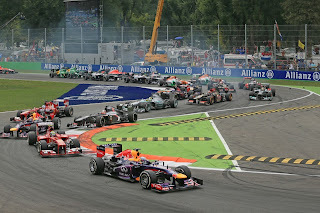 Felipe Massa was close at hand too, finishing just three seconds adrift of the pair in fourth after a good drive. 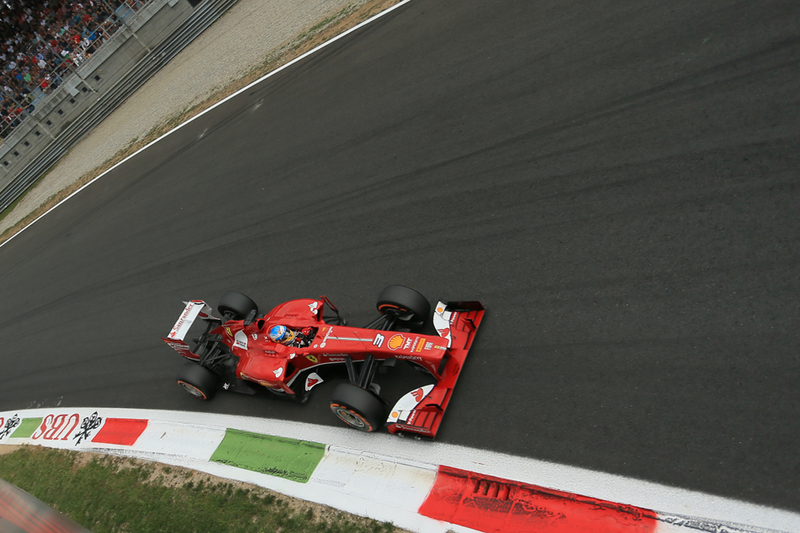 The trouble for Massa is that his better run came on a day when one of the most oft-mentioned suitors for his Ferrari drive from 2014 onwards, pacing around impatiently outside the Maranello front door, put in a stunning drive, and was man of the match quite possibly. 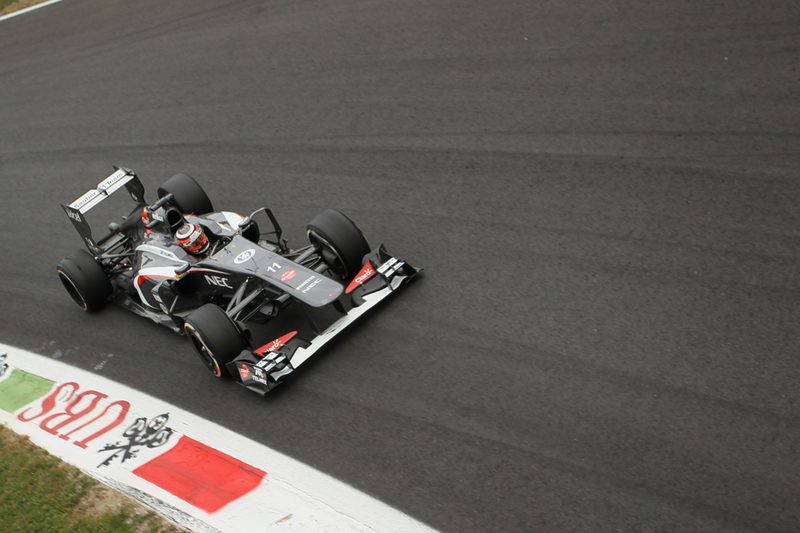 Nico Hulkenberg, after a season persevering with the disappointing C32, followed up on his brilliant qualifying result of third by defying gravity and keeping the car up among the front-runners throughout the 300km of the Monza race. He stayed on the back of the Webber and Ferraris group throughout, and was only five seconds shy of second place at the end, as well as kept Nico Rosberg's Merc at bay. Fifth place was his reward. And it couldn't have been a better time or place to remind us all of his star quality. Daniel Ricciardo, having got his big promotion, gave further evidence that he is worthy of it by finishing seventh, rather countering those who say he can qualify but can't race. And while today's result stretched Alonso's championship hopes close to breaking point, it most probably snapped those of Lewis Hamilton and Kimi Raikkonen. Both started low, both showed pace but had delays which precluded a better result, and while Lewis scored small Kimi didn't score at all. Kimi had his front wing broken on the back of Sergio Perez's McLaren at Monza's notorious concertina of the first chicane, which had to be changed immediately. In Lewis's case, he got a slow puncture from the debris of the same incident, which necessitated an extra stop and rather dashed his initial hope of running a long one-stopper. Still, the fine frolics of both as they progressed through the field provided an entertaining diversion. It was a race that needed it though. Of course, there's a lot to admire about a driver and team in unison at the top of their haughty games, and equally there's no blame to be attached to them that the others can't keep up. But in terms of a competitive spectacle it's rather lacking. Long before the end by hardly showing Vettel at all even the FOM TV producer seemed to conclude that it was all over bar the shouting, pretty much like the rest of us. And it may not be so merely about today either. Stellar performance from Vettel + Red Bull. No one has been able to push them below the podium since Spain except their own gearbox at Silverstone. They dont make for exciting viewing but the end results are simply jaw dropping. Seem to be galloping towards their fourth consecutive drivers championship.